Accommodation in Kleinmond: The Wild Fig Self Catering. Two separate units, one sleeping four and the other, two adults plus one or two small children. Both units have self-catering kitchens, bathrooms and seaviews. Both units also have DSTV and braai facilities on the patio. The Wild Fig is in a quiet residential area, just a street block away from the sea and just around the block from the picturesque Harbour Road with its arriving and departing fishing boats, its variety of eating places and interesting little shops. Kleinmond also has its magnificent mountain which abounds with hiking trails of varying degrees of difficulty and the beautiful Palmiet River that offers canoeing and even kayaking. Address: 5 De Vos Street. 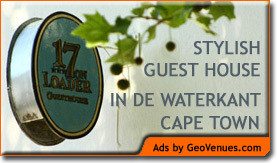 For accommodation in de Waterkant, Cape Town, stay at 17 on Loader Guest House. Click here for more information. Herd’s Cove Bed and Breakfast.